Ryder has a home! 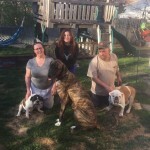 - Rocky Mountain Great Dane Rescue, Inc.
Ryder has a home with her foster family in Lincoln, NE. Joan is no stranger to adopting from RMGDRI! This will be the families 3rd dane from the rescue. Recently they lost their sweet Zena to bloat. Joan and her family love to go on daily walks, camping, and working in the yard gardening in the summer. Ryder came to Joan as a foster and it didn’t take long at all before she knew he wasn’t going anywhere. He has fit in perfectly with Joan’s family and her two English Bulldogs. Congratulations Ryder! New photo coming soon!